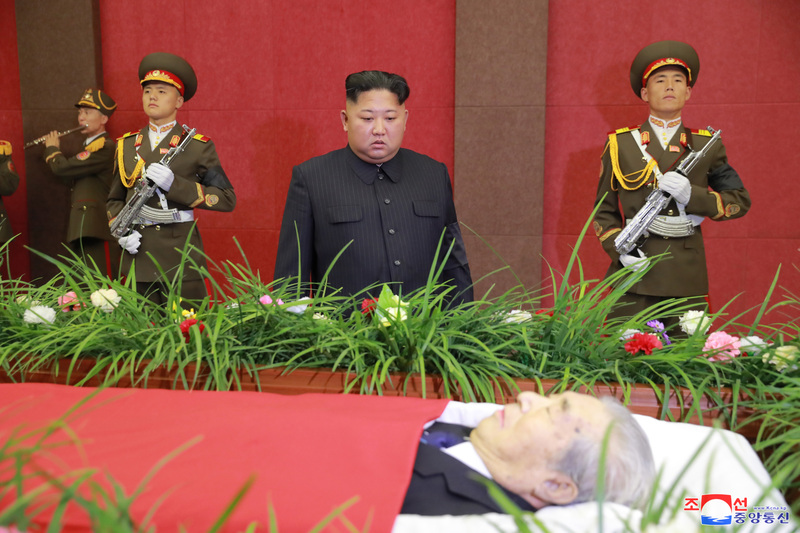 Kim Jong Un (Kim Cho’ng-u’n) paid his respects at a viewing for Ju Kyu Chang (Chu Kyu-chang) on September 4 (Tuesday). Visiting the funeral parlor with him were Workers’ Party of Korea [WPK] Vice Chairman and WPK Munitions Industry Department Director Thae Jong Su (T’ae Cho’ng-su), WPK Vice Chairman and WPK Cadres’ Affairs Department Director Kim Phyong Hae (Kim P’yo’ng-hae), WPK Munitions Industry Department Senior Deputy Director and Operations Command Group member Ri Pyong Chol (Ri Pyo’ng-ch’o’l) and WPK Central Committee Department Deputy Directors Hong Sung Mu (Hong Su’ng-mu), Hong Yong Chil (Hong Yo’ng-ch’il) and Kang Pong Hun (Kang Pong-hun). 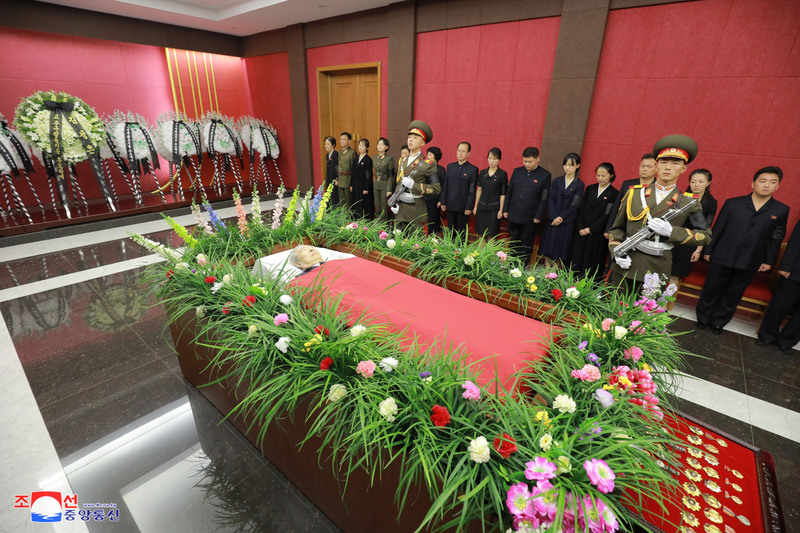 Members of Ju Kyu Chang’s family stand alongside his casket on September 4, 2018 (Photo: KCNA/Rodong Sinmun). 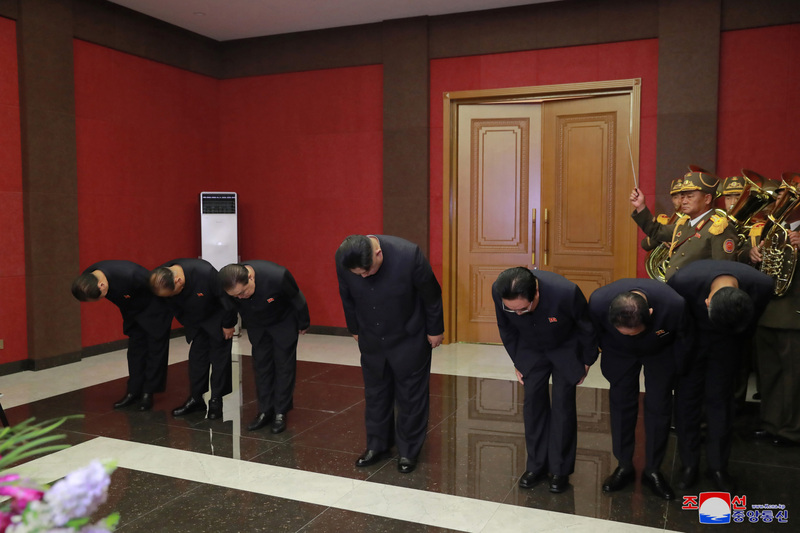 Kim Jong Un and senior WPK Central Committee officials bow in front of Ju Kyu Chang’s casket on September 4, 2018 (Photo: Rodong Sinmun/KCNA). 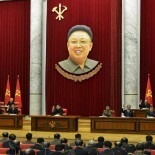 This article was written on 05 Sep 2018, and is filled under 2007-2010 kpa management, 2nd Academy of Natural Science, Atomic Weapons Institute, Ballistic Missile Guidance Bureau, Central Committee, Central Military Committee, critical infrastructure, DPRK Cabinet, DPRK General Department of Atomic Energy, Events Management Section, Executive Policy Bureau, Gen. Ri Pyong Chol, General Affairs, General Department of Atomic Energy, Guard Command, Hong Sung Mu, Hong Yong Chil (KWP MBID), Kang Pong Hun (WPK CC), Kim Chong-un inspections, Kim Family, Kim Jong Un Visits, Kim Jong-un, Kim Phyong Hae (Cadres/NPYPPC), KJI Personal Secretariat, KN-08, KN-09, Korea Committee for Space Technology, Korean People's Air Force, Korean People's Air Force [KPAF], Korean People's Army Air Force, Korean People's Internal Security Forces, Korean People's Army (KPA), Korean Workers' Party (KWP), KPA General Staff Nuclear Chemical Bureau, KPA multiple-launch rocket systems, KPA Strategic Rocket Force Command, kpif, Machine Building Industry Department, Ministry of Atomic Energy and Industry, ministry of people's security, Ministry of State Security, Musudan IRBM, National Academy of Defense Sciences, National Defense Commission (NDC), North Korean press, nuclear weapons, Political Bureau, Punggye-ri Nuclear Test Site, Pyongyang Defense Command, Ri Pyong Chol, road mobile ballistic missile, Rodong 1, Rodong 2, SCUD, Second Economic Committee, Second Economy Commission, Secretariat, short-range ballistic missiles, State Affairs Commission, State Security Department, Tae Jong Su, TEL, Unha-3 Carrier Rocket.